Inspired by Couture Style and Chic Designs, this beautiful COUTURE red and green Beaded Salad Set set is a bit of luxury for your table. 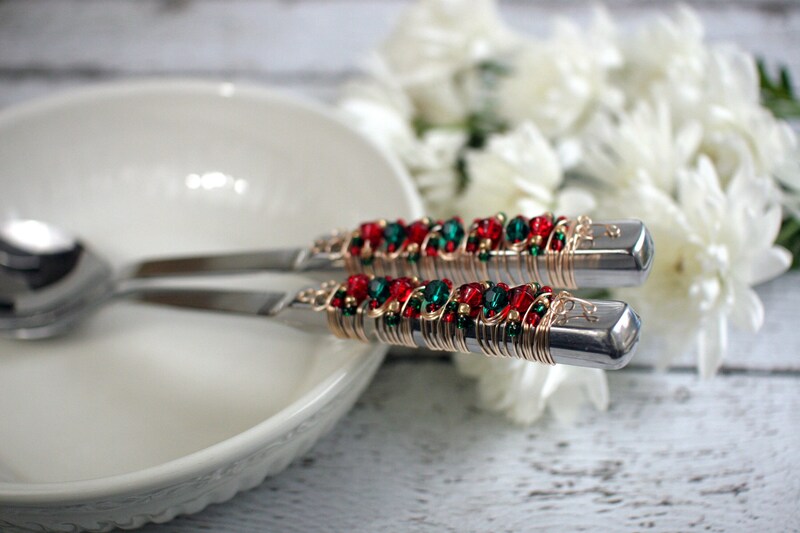 Perfect gift for that host or hostess that adores a bit of luxury while they entertain. This is a MADE TO ORDER ITEM. Bead placement will vary slightly. I use a non-tarnishing gold wire and a variety of red and green glass beads.This is sold in a SET OF TWO. One Stainless Steel Slotted Spoon and Serving Spoon. Each measures approx. 12 1/2" in length.